We provide high quality tennis programmes for young girls and boys. We host a number of fundraising campaigns and events throughout the year and aim to provide fundraising opportunities for everyone! The Elena Baltacha Foundation was established in 2014 to support the work that former British Tennis No. 1 Elena Baltacha had begun before she sadly passed away. 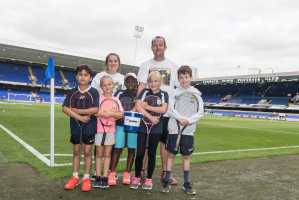 The Foundation has ensured that the support from the professional tennis world and the general public has been focussed in the right way, and all donations raised from subsequent fundraising initiatives have been put to good use. The Foundation has also provided financial support to EBAT, the Elena Baltacha Academy of Tennis, which was set up in 2012. Elena Baltacha set up her Academy with one goal – to give more children, from all backgrounds, the opportunity to learn to play tennis. The Academy, initially based in Ipswich (UK) has helped many children from all backgrounds with coaching and performance support, including helping many children from deprived areas and disadvantaged backgrounds, with free and subsidised coaching and performance support. With the help of volunteers, corporate sponsors, coaches and parents we are able to bring tennis to more and more children every year. Some progressing far enough to join our Elite Squad, where these players are given world class coaching and support to nurture them through junior competitions and beyond. Elena Baltacha (Bally to most) had a very strong vision for her academy, it is our job to ensure this legacy is fulfilled through the academy and schools. We are always on the look-out for people and organisations that want to help raise funds for Bally's foundation. Whether you're thinking of organising a bake sale or looking for corporate sponsorship our team are here to help. Looking for inspiration? Why not visit our fundraising page, where we have put together a few of our most successful ideas to help get you started. Corporate sponsors can find out more about our various packages by hitting the button below.